When my hero, Ross, asked me to marry him, we had already planned to take a trip to Thailand in 2008. Since we already scheduled time off work for our trip, we decided to plan our wedding around our Thailand trek and we immediately set up our Traveler's Joy site as our wedding registry. Both seasoned travelers, Ross and I spent more time planning our honeymoon than planning our wedding. 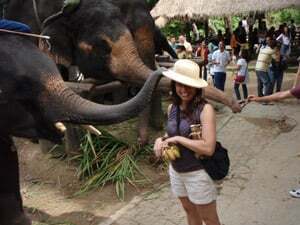 We used the Fodor's Travel book and the Lonely Planet guide for Thailand to layout an itinerary for our adventures and our trip was all about adventure!! After celebrating our wedding with 30 of our closest friends in the beautiful Shenandoah mountains, we made our way to the airport to depart for Thailand on August 24th, 2008. Landing in Thailand, we wanted to first spend a couple days in the capitol city, Bangkok. Though neither of us are city folk, there are parts of Bangkok which are "must-sees". Here, we stayed at the Rembrandt hotel. A co-worker with international connections set us up with a driver who served as our tour guide for the next two days. We visited the Grand Palace, the emerald Buddah, and a variety of sacred Wats, including Wat Pho which is the home to the world's largest reclining Buddah. Immersing ourselves in the culture of Bangkok, we found these sites absolutely glorious. We also enjoyed the culinary culture of the city, dining at the famous Seafood Market where we handpicked our fresh seafood selections before they were prepared for us. When we departed Bangkok on a shuttle plane, we headed to the northern part of Thailand and the province of Chiang Mai. This area of Thailand was a literal cornucopia of adventure for Ross and I. We stayed at the phenomenal Riverview Lodge (highly recommended by the Lonely Planet). Our room overlooked the river and the hotel's awesome gardens. We enjoyed a quaint local breakfast each morning in the gardens and took a daily afternoon swim break at the Lodge's pool. During our stay at the hotel we were approached by a local photographer who was shooting for the hotel's website. She took over 300 photographs of us (some of which reside on their website at www.riverviewlodgch.com) which she later emailed us. We had our own private professional honeymoon photographer at no charge! In Chiang Mai we enjoyed so many different activities each day. On our first day we had a traditional Thai couple's massage, my husband's first professional massage ever! We also dined at a really great restaurant called the antique house that evening where we ate fried worms! On our second day in the north, we went mountain biking in the Doi Suthep park. It was a challenging, scary ride, but we made it down the mountain. At the end of our trip, our biking guide served us a great meal and some Singha beers on the lake to celebrate our survival. That evening, we enjoyed a night safari, riding around to see all of the region's animals, while we tried to rest our aching muscles. 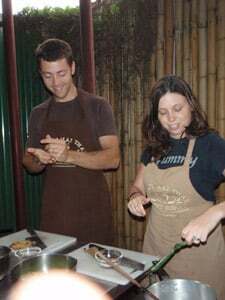 Our third day in Chiang Mai, we took an all day cooking class. Our instructor spoke amazing English, took us to the market to train us how to shop for Thai ingredients, and taught us how to cook 7 amazingly delicious dishes including traditional drunken noodles. Definitely one of our favorite days, we still use the cookbook the school provided almost weekly! We closed out our day with a trip to the Chiang Mai night market where we found some very cool local crafts including a beautiful handcrafted silk duvet. Our final day in the northern province, we trekked to the Sankempaeng Hot Springs where we soaked in a private pool and checked out the boiling geysers. We were amazed that the locals were boiling raw eggs in the springs. Our last adventure in Chiang Mai was a visit to the province's Elephant Training School. We watched the elephants shoot darts, challenge each other to a soccer game, paint pictures, and play the kazoo. We also took a guided elephant ride around the jungle. We had such an amazing time in Chiang Mai, it made it pretty hard to leave, but we departed on another commuter plane and headed for our final destination, Railay beach. We selected Railay because it was a secluded area, only accessible by a traditional Thai longboat. In addition, Ross is an exceptional climber and the area is one of the Pacific Rim's hottest rock climbing locales. 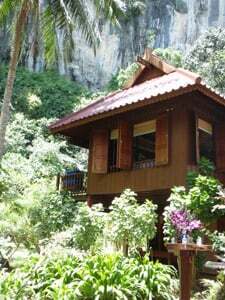 When we arrived at the boat launch, we were met by a boat chartered by the Railay Beach Club, we found our beach house using the Lonely Planet guide and we were so amazed by our accommodations. Our private house was secluded, beautiful and comfy. Each morning, we were greeted by monkeys outside our open-air bath. We watched some of the most beautiful sunsets, kayaked through caves and rock formations, climbed down into a private lagoon, and used our climbing equipment at three different spots. We also swam and enjoyed the almost private beach outside our house. In the evenings, a chef brought food to our private paradise and cooked for just the two of us. She made us a variety of traditional Thai dishes with plenty of leftovers for lunches the next day. We were also visited by Thai masseuses each evening for relaxing couple's massages. And we even had a pet for our stay, a lovely cat who we called "Noodles". When we got back on the airplane to leave Thailand on September 9th, 2008, we knew we'd made the most of our honeymoon trip. We enjoyed so many adventures, so much beauty, and so much culture. Amazingly, using airline miles to cover our airfare, and our Traveler's Joy registry contributions of $1,200, we spent only $300 on our honeymoon trip. Between the value of the dollar in Thailand, our awesome travel guide books, and our kind friends and family, we had the adventure of a lifetime on a very limited budget. This is a destination everyone should put on their travel list. We won't ever forget our trek to Thailand, and we'll certainly enjoy these memories far more than we might have appreciated a fondue set from a more traditional registry!